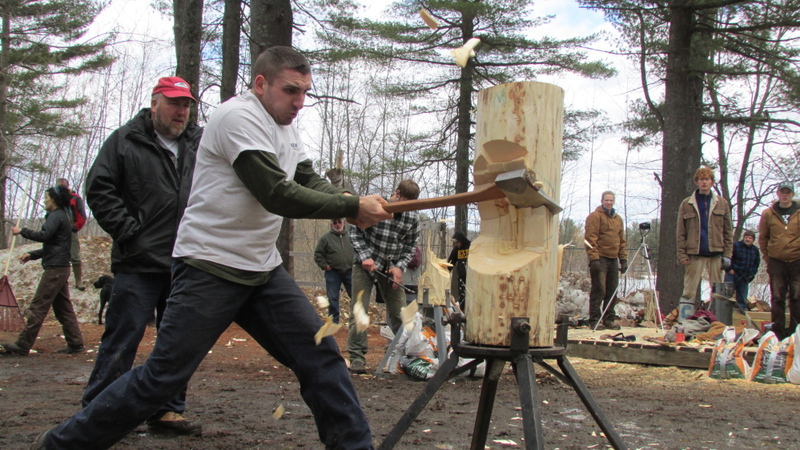 Coed woodsmen competition featured nine teams from across the northeast U.S. and Canada. WATERVILLE — With the ground still soaked from a day of rain and weeks of snow melt, the annual Colby College Mud Meet woodsmen competition lived up to its name when teams took the field Saturday afternoon. Under gray skies, coed teams from nine northeastern colleges chopped, sawed and rolled logs across Colby’s woodsmen field, turning it into a squelching morass. Luckily, sportswear in the timber sports world leans heavily towards the rugged, with work boots, blue jeans and Carhartt canvas jackets common apparel for the 100 or so competitors and spectators. Since 2007, Colby’s “Jack and Jill” meet has required schools to field competitors of six equally divided between men and women. The all-day competition features events for singles, doubles and teams, where competitors roll logs, use axes to chop through vertically and horizontally positioned chunks of wood, and use huge bucksaws on wooden beams. Teams from Unity, Dartmouth, and Colby colleges, the universities of Maine, New Hampshire, Connecticut and Vermont, State University of New York College of Environmental Science and Forestry, and Maritime College of Forest Technology from New Brunswick all sent teams to Saturday’s event. The Mud Meet is the final local event of the season with a season ending meet scheduled at Dartmouth College in Hanover, N.H., later this month. The woods were filled with cheers and applause as teammates and spectators urged the competitors on. Wood chips flew into the air as Kelly Corbine, a senior at State University of New York, hacked into a 10 1/2 inch-thick vertical log, held up in a stanchion. The exercise, where two teammates chop through the log, simulates cutting down a tree. Corbine, who studies natural resource management, said the woodsmen team attracted her because it was so opposite from other sports she’s tried. “I used to be a figure skater,” Corbin confided. The team also provides her an opportunity to try out a sport Corbin might not be able to do on her own, she added. “I know there’s not going to be an option outside of college to do it,” she said. But involvement in timber sports remains small, partially because people don’t think they can do it, said Natasha Kosowsky, a sophomore at Unity College. “When we try to recruit people, they say, ‘I can’t do it, I can’t chop wood,'” Kosowsky said. But after joining a practice once or twice, newcomers get hooked. “They end up loving it,” she said. 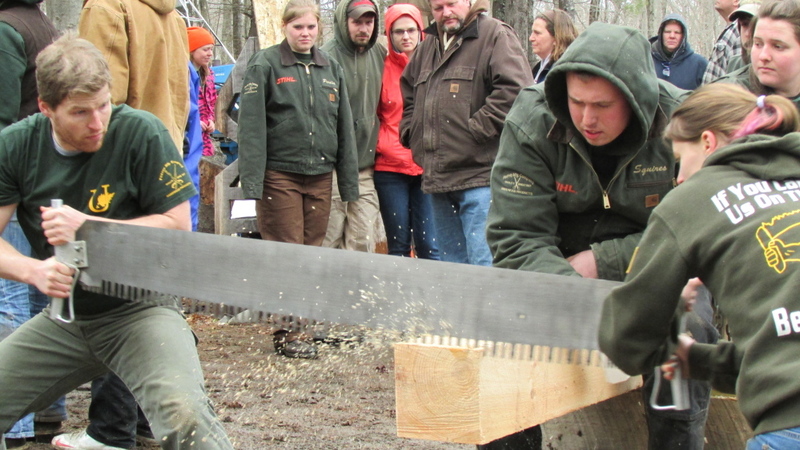 Although it might not seem like a typical sport to many, Colby sophomore Kate Fotos insists woodsmen events are just as athletic as any other team competition. While competition can be fierce, there is a lighthearted, almost festival atmosphere to woodsmen events like the Mud Meet. While the northeast has some of the country’s most active collegiate woodsmen programs, it is still very much a niche activity. “You get used to competing against the same people,” said Unity College student Matt Squires. Squires and other Unity students, in green jackets with the gold Unity Woodsman logo emblazoned on the back, watched their teammates tackle the horizontal chop event. Standing in a line, competitors swung axes over their heads and back down, hacking away at chunks of wood between their feet. Nearby, Pat Clark, known affectionately as “mama woodsmen,” smiled as she watched her students compete. Clark, who teaches communications at Unity College, has been involved in the school’s woodsmen team for more than a decade, first as a competition judge and then as coach. She had friends who were involved in the University of Maine team when she went to college in the 1960s, but she didn’t get involved until much later, Clark said. “When I was in college, women weren’t allowed on the woodsman team,” she said. While plenty of women now take part in college competitions — some of the teams at Saturdays meet had more women than men — women are still breaking into the professional circuit, said Kendall Edmondson, a graduating senior at UNH. Edmondson started woodsmen competitions at UNH, but broke into the pro circuit last summer, competing in events across the northeast. Professional timber sports, where wins and losses are measured by tenths and hundredths of seconds, can be intensely competitive, but there is still a camaraderie among competitors, Edmondson said. “Everyone is not in it for themselves,” she said.